I am not even sure how it happened, but it did. Not only do I drink Yerba Mate every morning, but when the night comes...so does the party. Oh, if you haven’t heard of the company with the funny name and the crazy patterns, you haven’t really lived. 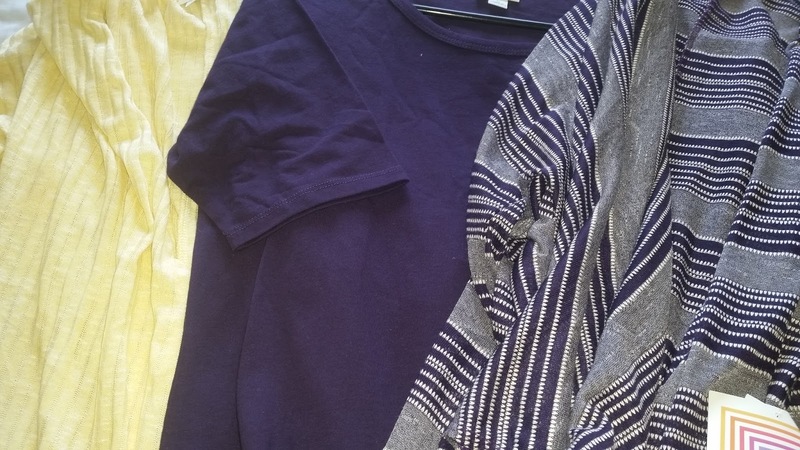 Kind labor practices- I read about how workers are treated in many garment factories and I went on a mission to find clothes that were made in America, or if not made in America, produced with kindness elsewhere. LuLaRoe has been almost totally made in America until recently when need outpaced production. Now they do have factories overseas but they are impeccable in their treatment of workers, which I love. Will you spend a little more on clothes made this way? Yes, but they also last well and are high quality. Love it. Shopping without children...yes please! Going shopping had seriously become such a yucky experience that I dreaded it and was stuck going to Kohls after the children were comatose in their beds. Now I can shop from my phone with friendly consultants after I put my kids in bed. It’s pretty much perfect in every way. I know some people hate seeing all the online parties and multi-level marketing stuff in their facebook feed. I wonder what their deal is because I LOVE knowing that I am helping out a friend when I buy my clothes. I would way rather help a stay at home mom stay at home or help a couple make extra money and pay off their house than give my cash to a big box store. Plus, they are super helpful in helping me get what I want. Seriously, I love these clothes. They feel so good and, they don’t make me hate myself if I ate a doughnut. Because- spandex is forgiving and it loves me even if I am bloated. Kimonos that flow- oh yes. The super long Ana dress (yes the clothes have names- because they are your friends!) that my girls say is a princess dress. Leggings- yes the softest leggings ever. Dude. Love it. The thrill of the hunt- In LuLaRoe there is a special vocabulary. For real. You have consultants. You search for unicorns. Unicorn, you ask? Yeah, a unicorn is piece of clothing that you need and is hard to find. Let me explain… LuLaRoe makes a limited number of pieces in each type of fabric. For instance, they have about a dozen designs- a few different tops, four or five dress styles, several skit styles, etc. My unicorn! 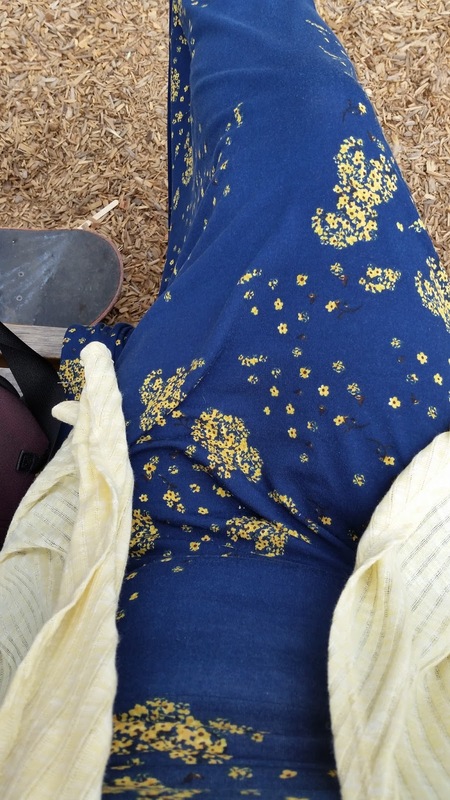 A blue Ana dress with yellow flowers. I love it! LuLaRoe limits the number of pieces from each print- around 2000 or so. These are then divided into a few different style pieces, then various sizes. All the pieces are then sent out and divided up among consultants. Many consultants sell in once a week Facebook groups or in-person pop-ups. So, say you see something that you adore. Oh my gosh- it’s your size, your favorite dress, and a print that is to die for. What do you do? Well you BUY IT RIGHT NOW because it could be gone in 30 seconds and then you may NEVER EVER SEE IT AGAIN. Yeah. Did I mention Vegas? You get to dress how YOU want- I had so many clothes in my closet that kind of fit and were in a color I kind of liked. I love that LuLaRoe lets me dress how I want to dress. My favorite color is purple. I super love it. Now I can dress in my favorite color because the clothes come in so many different prints and colors. I can find stuff that fits me in my favorite color so I feel like my clothes are really mine. Love sewing? They have leggings for that! For real! LuLaRoe lets you dress truly individually and comfortably. That phrase, “the struggle is real” is super annoying, right? Except the struggle IS real with LuLaRoe. One day you are buying some cute leggings mostly to help out a friend who is having an online party, and next thing you know you are member of 50 facebook groups with consultants around the country, searching for that perfect perfect Julia in your favorite color and size. My loot from my personal consult with April! My favorite colors and some awesome layering pieces. Love. LuLaRoe pretty much makes life better. I love it! 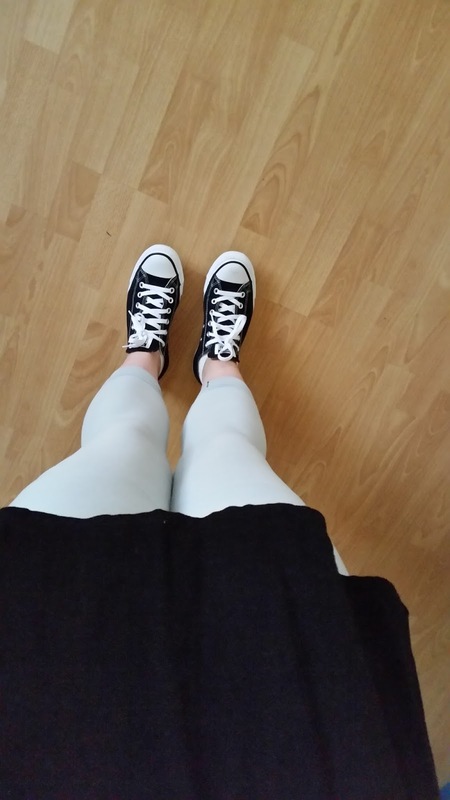 Super comfy leggings and Chucks? Yes please! No, I am not making a dime off of this post. I don't sell LuLaRoe, I just spend my money on it. You can shop with my awesome friend April right here! She does personal shopping visits on Skype. Tell her what you want, your favorite pieces and colors, and she can pull some awesome stuff for you. April Sunshine- April will do private shopping sessions where you tell her what you have in mind to buy, she pulls some items in your size, you get Skype, and you get to personally shop. It's awesome! I love that she does this. Check out her Facebook group and her Instagram account. A special thanks to April for providing some of the pictures for this post! Join her group by clicking here. Awesome stuff! Ashleigh Valdez- Ashleigh is launching soon and is doing tons of giveaways on her Facebook group! Join it! Erica Seawell- Erica is the gal that introduced me to LuLaRoe...So we can blame her. She has awesome stuff!